I Need a Good Laugh!!! See similar graphic below to DOWNLOAD a decade of professionally-archived newspapers. 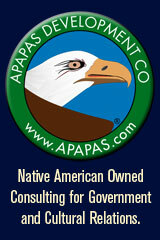 The primary purpose for “The Indian Reporter” is to provide the Tribal Community with current news and to provide information that may affect their everyday survival, established 1962 as a Southern California tribal newsletter, and here on the Internet in 2009. Please allow me to introduce myself and explain the purpose of The Indian Reporter Web site newsletter. 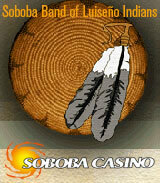 My name is Ernie C. Salgado Jr. and I am a member of the Soboba Band of Luiseño Indians. My reservation is located in Riverside County in Southern California approximately 90 miles east of Los Angeles and about the same distance from the City of San Diego. I have named the newsletter “The Indian Reporter” which I took from an old newsletter started by a friend of mine back in the early '60s. My friend, Bill Jennings — “Wild Bill” as we called him — died last year, but he left a legacy of our history in his newsletters, which can be viewed on the Soboba Web site, Cham-Mix Poki' (House of Our Culture), being developed by Dr. Charlene (Valenzuela) Ryan. Dr. Ryan is also a member of the Soboba Band of Luiseño Indians and the former Cultural Coordinator for our Tribe — more on Dr. Ryan later. Bill was not Indian, he was a newspaper feature writer for the Riverside and Hemet newspapers and he produced “The Indian Reporter” with his own money and what little contributions were given to him. Wild Bill championed the Indian cause, something he did at his own peril. I have spoken to Bill’s wife, Anne, and have obtained her permission to use the name of The Indian Reporter. Again, thank “Wild Bill” for the head start. DOWNLOAD four-page PDF copy of the August 1962 newspaper. Access the Soboba Cham-Mix Poki' (House of Culture) Web site for more than a decade of archived copies of "The Indian Reporter" newspaper.